This distinctive traditional design hosts a 3 cavity cooker with gas hob and an A/A+ rating for energy efficiency, which makes this appliance a valuable and appealing addition to any kitchen. 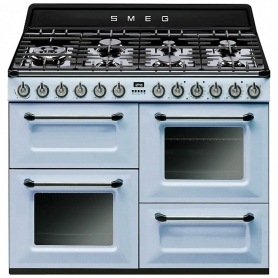 This beautifully crafted appliance has a softly rounded top, flat cast iron pan stands and classic controls. Solid doors with characteristic handles complete the design, combining clean lines with high quality components to offer you an easy-to-use cooker that produces excellent results while looking good in your kitchen. The main oven cavity in the TR4110P1 range cooker also offers a Vapor Clean option: this uses steam to loosen the deposits found on the oven interior, so that at the end of the program the cavity can be effortlessly wiped clean. The auxiliary oven features 6 functions, including an upper and lower element with fan setting to easily cook a meal for one as well as having 4 separate cooking levels and closed door grilling, for the ultimate in convenience and style. The fully variable grill compartment has 2 grilling levels for complete flexibility. A storage drawer placed in the lower right is well-located for storing away bulkier roasting tins and dishes. With a programmer/timer function, you can easily keep track of your cooking. 40/45 amp power supply required. Adaptable for LPG. 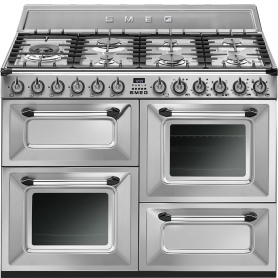 The Smeg name is linked to its roots in the Guastallia region of Italy. Smeg stands for ‘Smalterie Metallurgiche, Emiliane, Guastallia’ (a metal enamelling factory in Guastalla, Emilia, Italy). Smeg ensures exceptional build quality by using high quality components and applying rigorous testing to every appliance. It takes two years of research and testing before Smeg releases a product onto the market, and every appliance is tested for 15 years of use.